This year, I'm structuring things a bit differently in Algebra 1. Some changes have been for the better, and some haven't. I've already started making a list of things to keep and change for next year. Today, I want to blog about one of those things worth keeping. It's the type of thing that makes me wonder, "Why have I never done this before?!?" 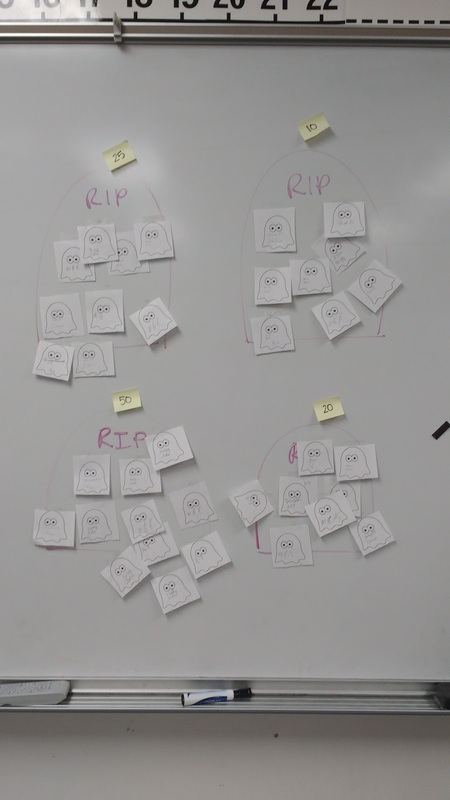 Yesterday, I posted about a Ghosts in the Graveyard game I made to review independent and dependent variables. To be honest, I have always HATED teaching independent and dependent variables. They were in the standards, so I taught them. 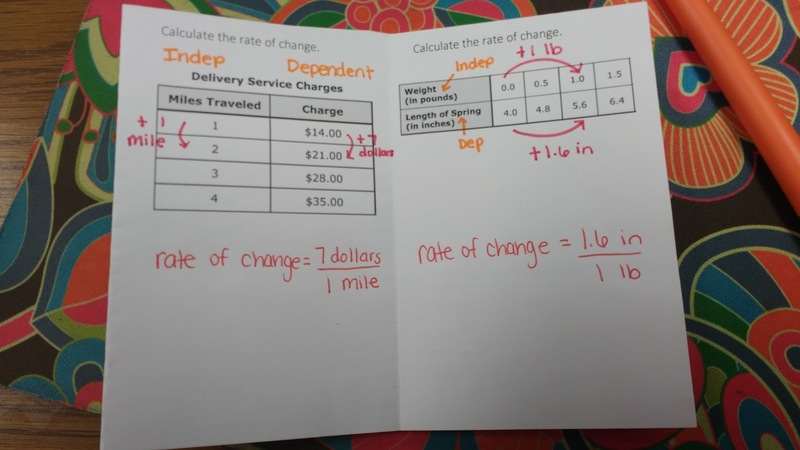 But, I never took the time to connect independent and dependent variables to the other concepts we were learning. No wonder I felt like it was a pointless thing to teach! This year, I decided to teach finding rate of change directly after teaching independent and dependent variables. It was a beautiful thing to watch it unfold! Every time I gave my students a table or set of points, we classified the variables as dependent or independent before moving on to finding rate of change. 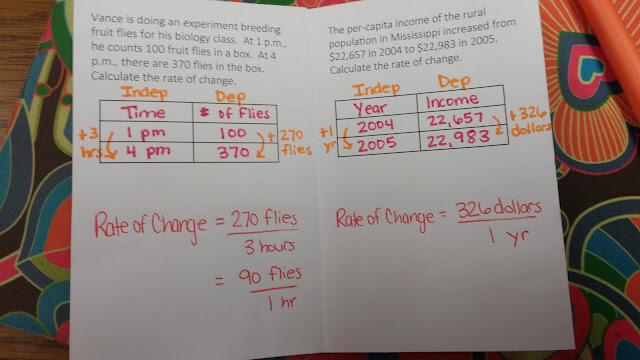 I defined rate of change for my students as the change in the dependent variable divided by the change of the independent variable. 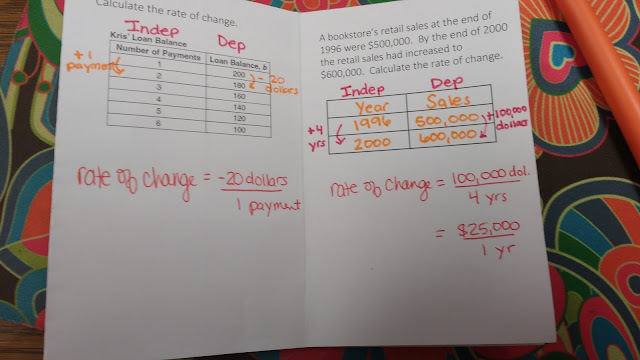 This is the first time I have ever taught rate of change independently from slope, and I LOVE it! My students are finding the slope, but they don't know that yet. Most of my 9th graders come in my room with a history of either loving slope or hating slope from their middle school years. By focusing only on rate of change and not slope, I'm giving them each a fresh start. 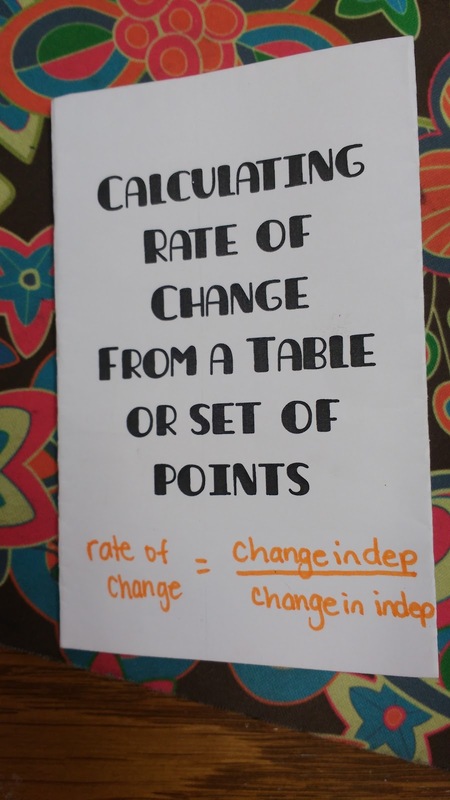 Here are the notes we ended up taking on calculating rate of change from a table or set of points. We made a small book to glue in our notes. You can find the instructions for folding this book here. Another BIG change I made this year was making students write the units next to the arrows they drew to calculate the change. My students are struggling so much less this year with remembering their units in their final answers. Yay! You can download the file for this practice book here. I recently played Ghosts in the Graveyard with my Algebra 1 students for the first time. Maybe I should rephrase that. I recently played Ghosts in the Graveyard with my students for the first time ever. It's October, so the theme is appropriate. Plus I needed a way to review dependent and independent variables after being out of school five days (three school days plus a weekend) for fall break. Ghosts in the Graveyard is a review game created by Kim Hughey. She hasn't blogged in years and years, but she still has ton of awesome posts to look through on her blog! Her blogpost has a great summary of how the activity works. I made eight challenge cards for my students to work through in pairs. The sentences on these cards were taken from worksheets I found online. This is the worksheet I stole from the most. 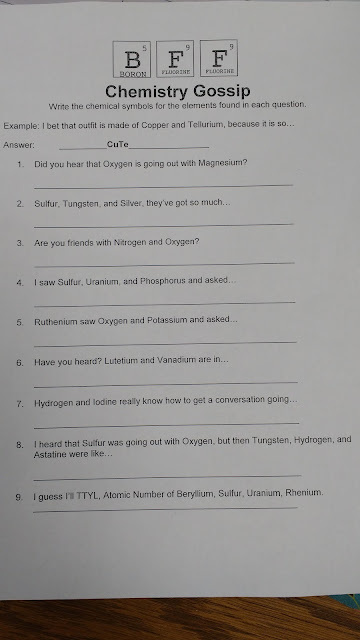 Students were also given a sheet to write all of their answers on to be checked. I found that this activity works best with students in pairs. 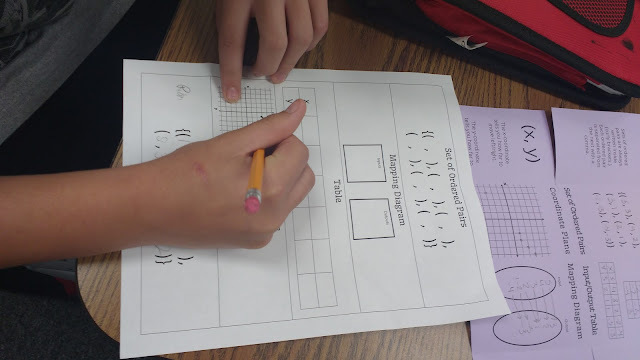 With this sheet, students were able to start with the challenge number of their choice. I tried playing this game once without a recording sheet like this, and it was quite chaotic. After each pair would finish a challenge, they would bring it up to my desk to be checked. Since each challenge had three different questions, one of two things would happen. I would tell them that they were all correct and give them a ghost to place in the graveyard, or I would tell them the number of questions that were correct or incorrect. They became very mad at me when I wouldn't tell them exactly which questions were correct or incorrect. It's okay. They lived. And, they were able, usually, to figure it out themselves! To make giving out ghosts easy on myself, I found a ghost clipart picture and printed it out a zillion times. The group members would write their name on their ghost and tape it to the tombstone of their choosing on the dry erase board. When there were five minutes remaining in class, I would announce the point values of each tombstone. I chose point values of 10, 20, 25, and 50 points. I just wrote these on a sticky note and stuck them on the tomb stones. I did try playing this with six tombstones once instead of four. It didn't work out nearly as well, but that was also the same game in which I tried playing it in 25 minutes instead of a full 50-minute period. This game really does need a full 45-50 minute period to work well. Want the files for this specific ghosts in the graveyard game? You can find them here! I'm not totally happy with my notes for electron dot diagrams, so I'm not posting the front of this foldable. My description is too wordy, and I'm not sure it totally summarized the process of creating an electron dot diagram. Also, I learned from reading lots of other teachers describe the process online that teachers can't really agree about how to teach it anyway. Some online explanations insisted you should put two electrons on one side before you put any electrons on any of the other sides. Other online explanations insisted you should put one electron on each side before doubling up the electrons on any of the sides. 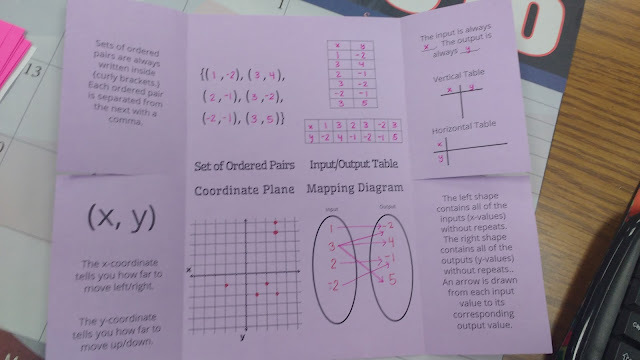 When I typed up my notes, I put an explanation of the process on the front of the foldable and a table with 12 practice problems on the inside of the foldable. Originally, my plan was to let students draw in the dots for the electrons around the chemical symbol. Then, I had the epiphany that we could use small circular stickers for the electrons. I have an entire tub of stickers in my cabinet, so lack of stickers was definitely not a problem. I gave students the choice between a sheet of animal stickers, smiley face stickers, and pawprint stickers. What does it say about me that I was able to give every single student in the class a full sheet of stickers without making them share? Yes. I own too many stickers. I promise I'm working on it. I told my husband this past summer that he had to stop me if I tried to buy any more stickers. Looking at these electron dot diagrams makes me so happy. My students caught on to this concept so easily that they begged to take the quiz right after we took the notes. I agreed because I'm ready to move on to ionic vs. covalent compounds. And, we'll get plenty more practice with electron dot diagrams in that section! Note to self: Edit version B of this quiz before teaching this class again. 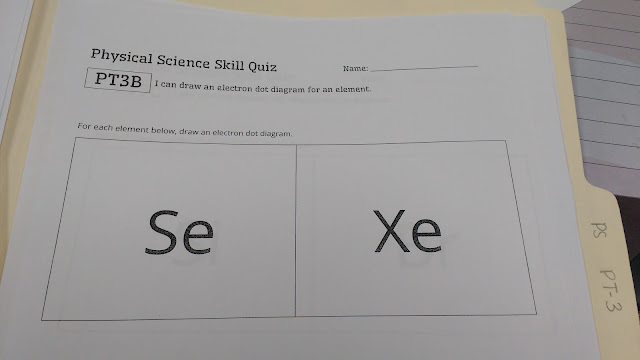 You know something has gone terribly wrong when 25% of the class (I write 4 versions of each quiz) starts giggling as soon as you give them their quiz. Short and sweet post today to let you know about an awesome activity I found for FREE on TpT. I gave it to my physical science students as a "let's get back in work mode since we haven't seen each other for five days as a result of fall break" activity. It only took five to seven minutes, and it had the whole room laughing and groaning. 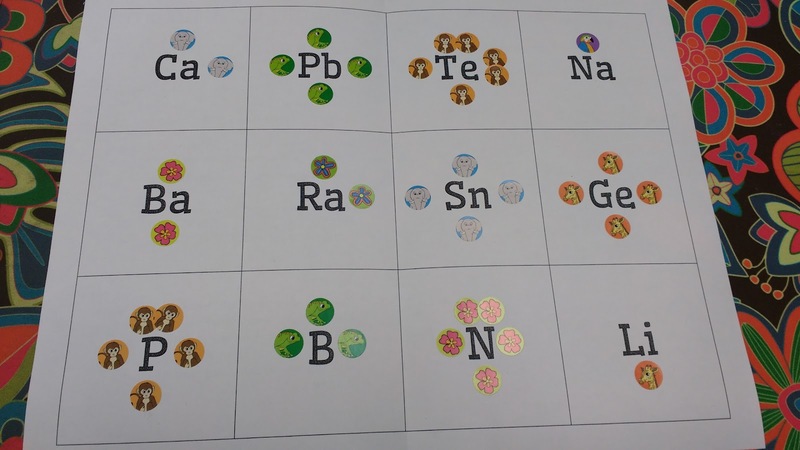 Plus, any activity that helps them get more familiar with their periodic tables is a win in my book! We're doing electron dot diagrams at the moment, and they have declared that the hardest part of the entire process is finding the element on the periodic table! 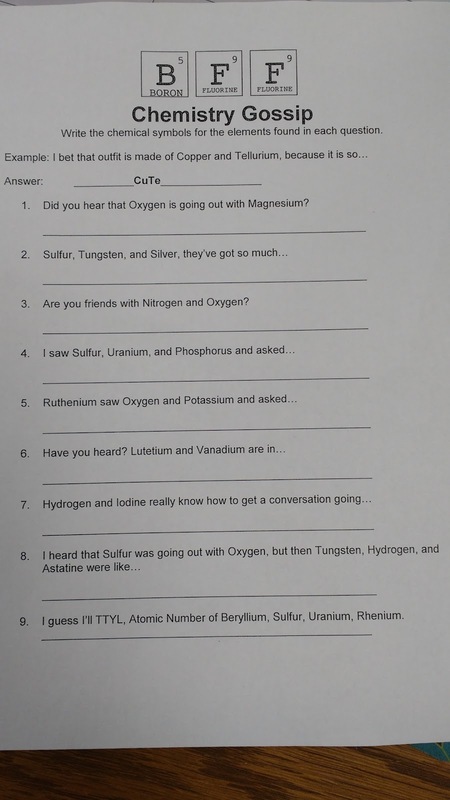 The activity I found on TpT is called "Chemistry Gossip" by Learning Is Not Quiet. Try to read these and not laugh. I dare you! 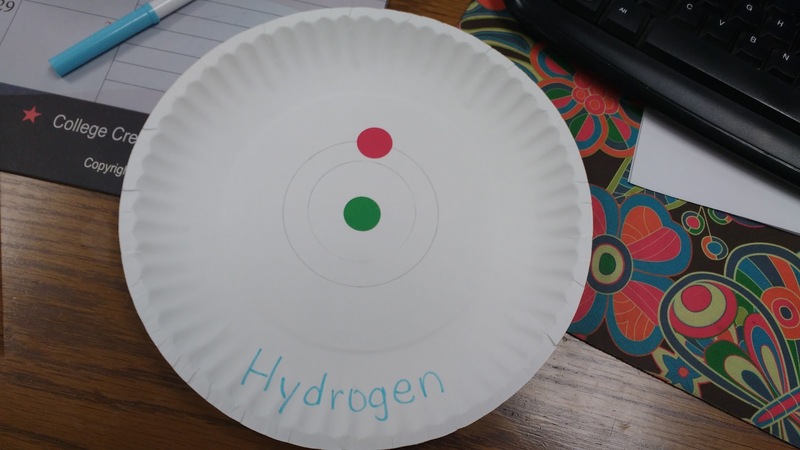 This activity is a definite keeper, and I plan to use it any time I teach physical science in the future. Want to know another reason I'm blogging about this activity? So I can find it easily in the future! I can't tell you how many times I have to search my blog to remember how I did something in the past. It makes me wonder how teachers who don't blog can keep up with everything they have done. The answer to that question is they are probably WAY more organized than yours truly! My Algebra 1 students recently started what is probably my most favorite unit of the year: introduction to relations and functions. Our first skill is to be able to generate equivalent representations of a relation and determine if the relation is a function. Today's post focuses on the first part of that skill: generating equivalent representations of a relation. In the past, I have made a 4-door foldable for this. It worked okay. Lots of writing which meant some students' notes were nearly illegible. My classes are bigger this year than they have ever been before, so I decided to pre-type as much of the foldable as possible. You can see more of my notes from 2013 here. Here's my new, pre-typed version. We began our discussion by creating a set of ordered pairs. I had six students each volunteer an ordered pair. There was one restriction. The ordered pairs had to fit on the coordinate plane below it. After writing our six ordered pairs, we moved to the input/output section of the table. 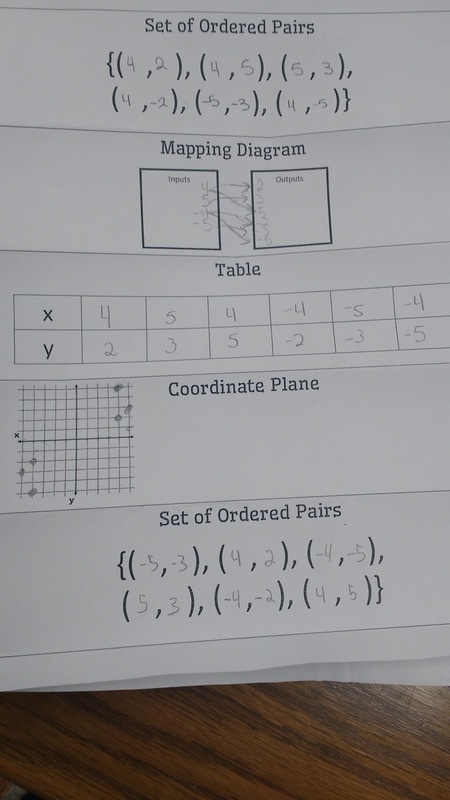 We discussed that they would need to be able to organize ordered pairs into a horizontal table or a vertical table. I asked them which variable was used to represent input and which variable was used to represent output. They easily supplied x and y for these blanks. 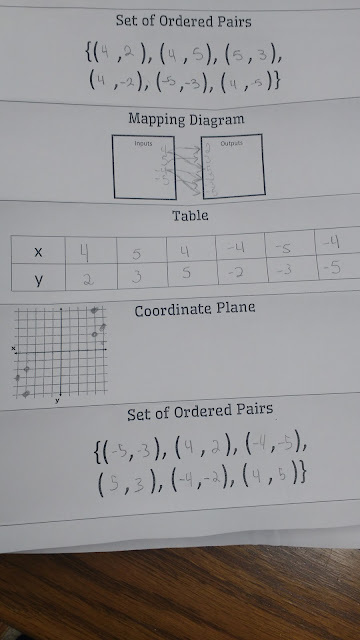 Next, we discussed where x and y belong on a vertical table vs. a horizontal table. In the past, my students have sometimes struggled with calculating slope from a horizontal table because they aren't sure which values are x and which values are y. This is my motivating factor for including both horizontal and vertical tables here. 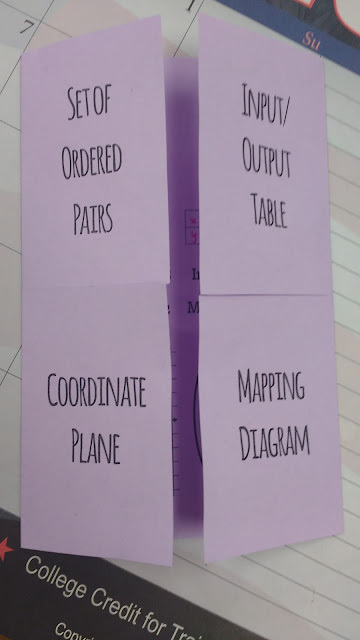 We took our ordered pairs from the previous section and turned them into both types of tables. After making our tables, we graphed our six points on the coordinate plane. Finally, I introduced my students to my most favorite representation of a relation--mapping diagrams. I didn't tell my students why they are my favorite, but I know they'll be able to tell why soon when we start classifying relations as functions or non-functions. We took our six ordered pairs and turned them into a mapping diagram. First, I had them write their x values in the input oval without repeats. Then, I had them write their y values in the output oval without repeats. Some students began to be very concerned about this. How in the world do we know which input matches up with which output? I am so very glad you asked. That's why we need arrows to connect each input value to its corresponding output value. And, our notes are done! Going through these four representations took about twenty minutes of our fifty minute class period. We spent the next twenty or twenty-five minutes working on a representations of relations telephone game. I was inspired to make this telephone activity by a chemistry tweet. Have you ever played the game "Telephone?" One person whispers a message to another person. That person whispers the message to yet another person. This continues until the message has been relayed through an entire line of people. Then, the person at the end shares the message they heard. This is compared the starting message, and usually quite a few laughs are had. This works just like that, but we're dealing with math. 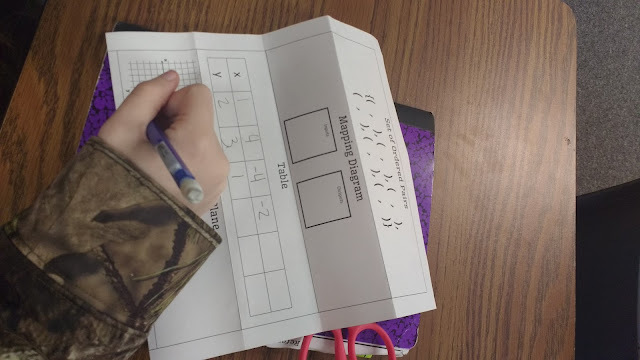 Give each student a sheet of paper, and ask them to accordion fold it on the lines between each section. This will save a lot of time later and throughout the activity! Notice that the sheet of paper both begins and ends with a set of ordered pairs. If all things work as planned, the set of ordered pairs at the top and bottom SHOULD match. Of course, we know things don't always work exactly as we intend them to in our classroom. All students were instructed to write their own set of six ordered pairs in the BOTTOM section of the page. 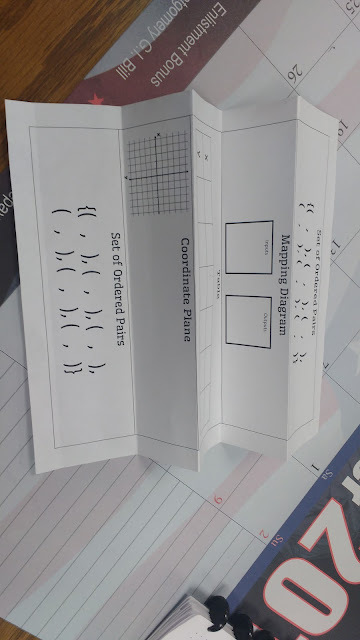 Just like with our foldable, they needed to make sense that their ordered pairs would fit on the coordinate plane found on the page. After writing their six ordered pairs, students traded papers with another student. They took the six ordered pairs written at the bottom and turned them into a table. Before passing the paper on to the next student, they had to fold up the paper so that the original six ordered pairs were hidden. 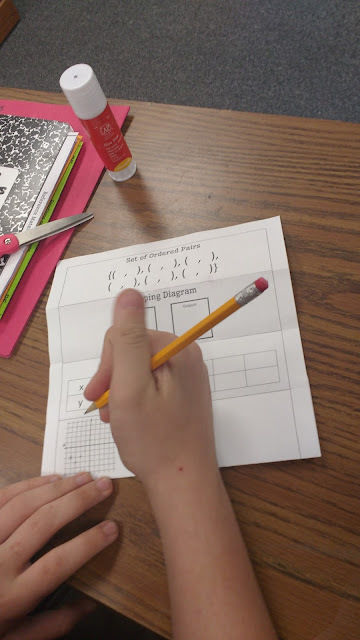 The next student to get the paper had to take the horizontal table and turn it into a coordinate plane. Before passing the paper on to the next student, he/she had to fold up the table to hide it from view. The next student to get the paper will take the coordinate plane and turn it into a mapping diagram. Before passing it to the next person, he/she will fold up the paper to hide the mapping diagram from view. 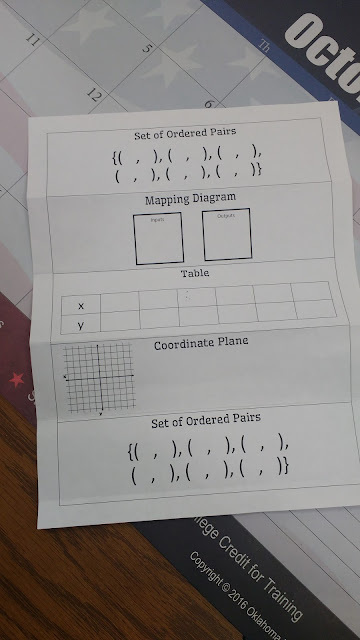 When students got their papers back, the first thing they had to do was check and see if the set of ordered pairs at the top of the page matched the set of ordered pairs at the bottom of the page. Many were surprised to see that the order didn't match, so we had to talk about why that would be the case. For some students, their ordered pairs matched perfectly. For others, they didn't. This means they had to look through the different representations and figure out where things went wrong. So many awesome conversations came out of this. And, I hope this activity drove home the fact that precision is super important when translating from one representation to another! As my students found out, one tiny mistake can change the entire problem. I loved the telephone structure of this activity, and I look forward to finding other ways to use this practice structure in class. 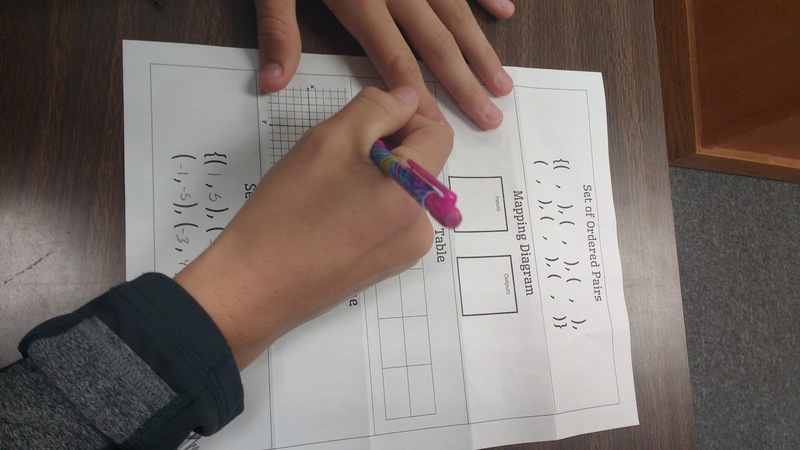 It fits in tons of practice and error analysis without seeming like work! Files for the foldable and activity can be found here. 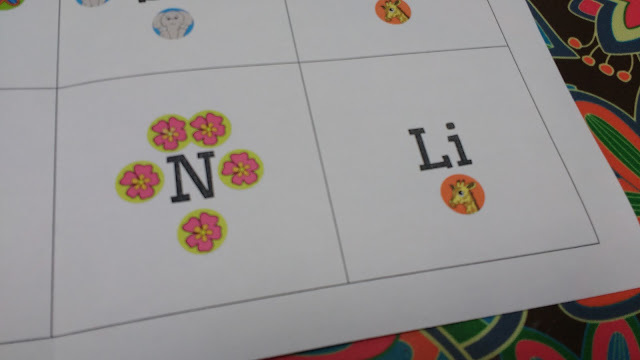 One of our main goals in physical science is to recognize patterns in the periodic table based on valence electrons. Before we can jump to talking about valence electrons, we first need to just learn about the placement of electrons in the atom. After doing a foldable with lots of practice Bohr models, I assigned each student 1-2 elements. 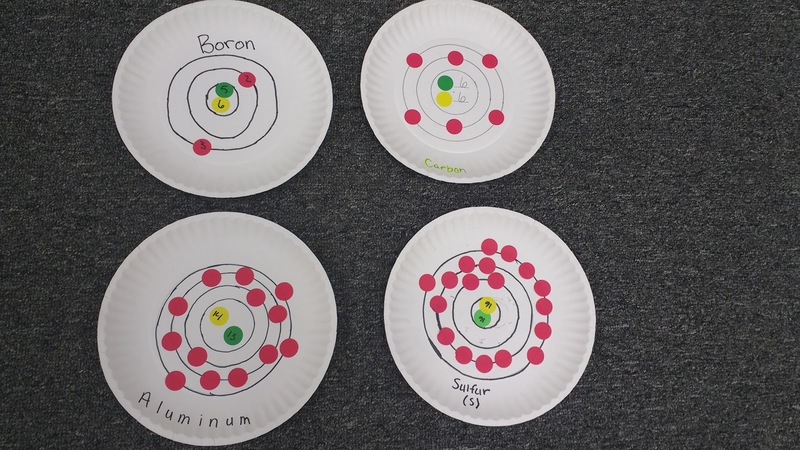 We used paper plates, markers, and dot stickers (affiliate link) to make paper plate bohr models for each of the first 20 elements on the periodic table. 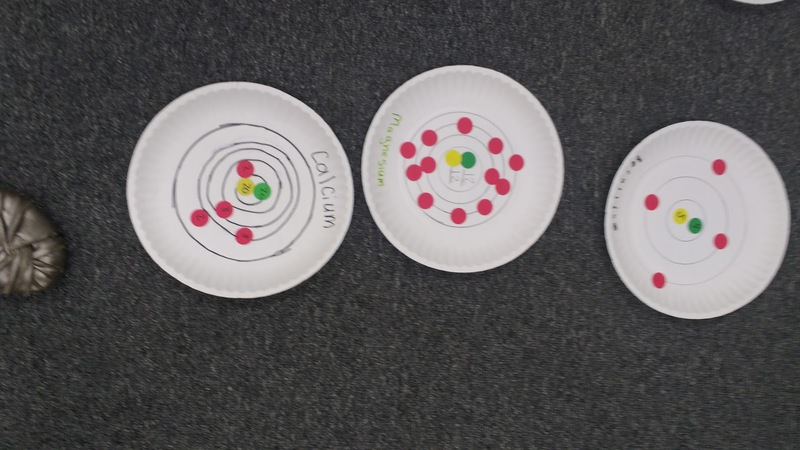 We used green dot stickers (affiliate link) to represent protons, yellow dot stickers (affiliate link) to represent neutrons, and red dot stickers (affiliate link) to represent electrons. 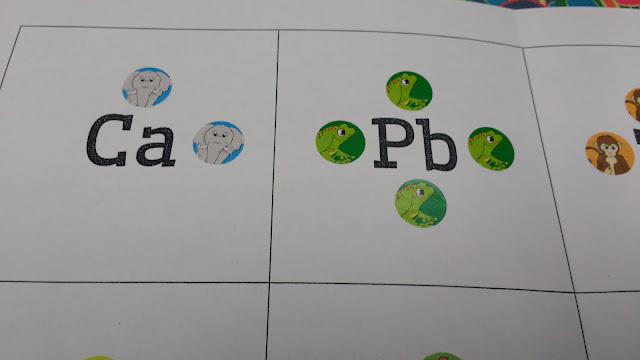 Originally, I was going to have them put 2 green stickers to represent 2 protons, but then I realized that when we got to element 20 it would become WAY too much. So, we used one green sticker for the protons, and we wrote the number of protons on that green sticker. Same for the neutrons. 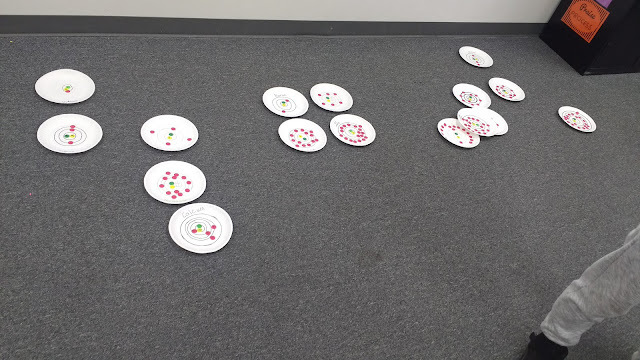 I had my students calculate the neutrons using the average atomic mass from the periodic table. I didn't take a picture of this stage of the project, but I had students draw their Bohr models on their dry erase boards and have them checked BEFORE moving on to the paper plate stage of the project. This helped clear up some misconceptions about how to make a Bohr model! As students finished their paper plate bohr models, I asked them to arrange them on the floor at the front of the classroom as a periodic table. Here's what it ended up looking like at the end of the period. The first thing you'll probably notice is that there are not 20 elements. Some students did not finish in the allotted time. Also, one student just threw his plates on the ground, so they are most definitely NOT in the correct spot. Special thanks to my husband for letting us borrow his compasses! This project is a definite keeper, and I look forward to building on it in the future if I get the chance to teach physical science again. 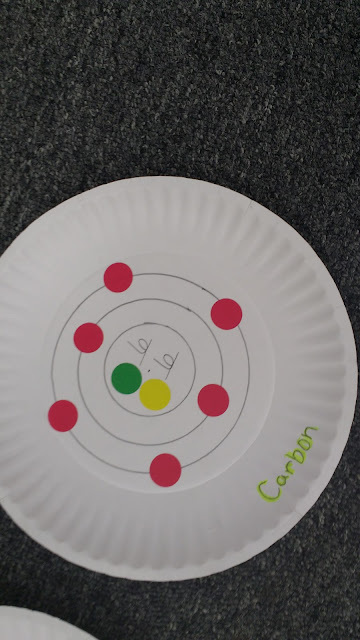 Some of the kids complained that their Bohr models weren't very pretty because there is just SO much going on. This makes the perfect lead-in to why we'll be moving to electron dot diagrams next!